[This] bromantic drama...becomes as frustratedly impotent as Lopez feels, and as chokingly symbolic as Ayers looks with an Uncle Sam top hat on his head and an American flag in his shopping cart. 117 min. Paramount Pictures, DreamWorks, Universal Pictures. Director: Joe Wright. Cast: Jamie Foxx, Nelsan Ellis, Michael Bunin, Robert Downey Jr., Rachael Harris. 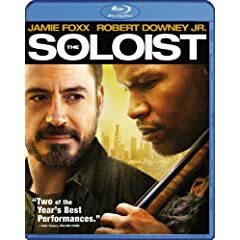 Even before newspaper editor Mary Weston (Catherine Keener) jokes to her ex-husband Steve Lopez (Robert Downey Jr.), "Your boyfriend is downstairs," it's clear that the fact-based The Soloist is a bromantic drama. L.A. Times scribe Lopez finds material for his "Points West" column--and more than he first bargains for--in neighborhood homeless man Nathaniel Anthony Ayers. A paranoid schizophrenic fiddling away on a violin with two strings, Ayers turns out to be a former Juilliard student driven by his mental illness out of a promising future and onto the streets. Lopez aches to help Ayers into a safer, saner life; what he offers to his new friend gets repaid in role-modeled gratitude for life's finer things: music and friendship. The complexity of the unfolding relationship between Lopez and Ayers is, of course, better recounted in the writer's columns and the book they spawned. On their way to the screen in a film written by Susannah Grant (Erin Brockovich) and directed by Joe Wright (Atonement), Lopez and Ayers become needlessly exaggerated caricatures of, respectively, acute, restlessly intelligent liberal guilt and the mentally ill homeless. The filmmakers feint in an interesting direction by teasing but never quite providing a neatly pat, "happily ever after" ending, but the narrative shape given to the men's story unsettlingly plays out as a nearly note-for-note remake of The Elephant Man, a much more extreme rewrite of history forgiven for its grasp of the bizarre and its visual and emotional elegance (a more recent comparison can be drawn betwen The Soloist and Rod Lurie's little-seen Resurrecting the Champ). 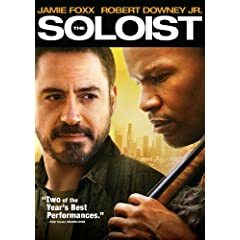 In both The Soloist and The Elephant Man, a privileged white professional discovers a maligned man living in squalor and disease, and adopts his cause, wishing all the while he could do more and nagged by the possibility that his motivation is not generosity but exploitation (at first, Downey's Lopez reductively concludes, "Nathaniel is a good column"). In both films, salvation arrives in the soothing balm of art, most notably in a reverie in an auditorium, where the marginalized man momentarily escapes his psychic pain by giving himself over to a colorful musical performance. In Wright's film, this performance becomes literally colorful, as Ayers closes his eyes and blisses out to a profusion of color while listening to the LA Philharmonic in Disney Hall. Technically speaking, it's a beautifully executed scene that, in a Fantasia vein, visualizes the liveliness and transportive quality of music. But it's also part and parcel of a general showy overstatement from which none of the filmmakers (Foxx and Downey included) seem immune. Ayers worships Beethoven, wondering at his magically sharing Pershing Square real estate with its Beethoven statue. Soon, the screen Ayers claims Lopez as his personal god, triggering Lopez's own personal mental disease, a strain of "White Man's Burden." "I don't want to take full responsibility," Lopez insists at one point, but he eagerly presses Ayers toward the LAMP Community shelter and the possibility of a studio apartment that would give Ayers a greater measure of safety. Ayers' irrational personal insecurities stand in the way of actual security, and his susceptibility to paranoid rages blocks him from opportunities to perform. The film makes much of the moment when Ayers drops the bomb "I love you" on Lopez, who seems to take it as some kind of threat before he embraces the gift of "grace" Ayers has laid on him. For a while, The Soloist coasts as smooth Hollywood entertainment buoyed by social conscience (though even the film's homelessness statistics are exaggerated, by tens of thousands) and indisputably impressive movie-star theatrics (with solid support from the likes of True Blood's Nelsan Ellis and Stephen Root, In the Loop's Tom Hollander and The Practice's Lisagay Hamilton). And certainly the film serves as a pointer to Lopez's writings and the important social work being done to address homelessness and mental illness. But by sticking to the broad strokes instead of exploring subtler notes, The Soloist becomes as frustratedly impotent as Lopez feels, and as chokingly symbolic as Ayers looks with an Uncle Sam top hat on his head and an American flag in his shopping cart. Without banishing the naturalism of film grain, the hi-def Blu-ray transfer of The Soloist dazzles with detailed clarity and spot-on color and contrast. Obviously, this brand-new film also benefits from spotless source material and state-of-the-art Dolby TrueHD 5.1 sound that recreates the theatrical experience. Bonus features include a commentary by director Joe Wright that proves informative about his intentions and approaches in tackling the material. "An Unlikely Friendship: Making The Soloist" (19:37, HD) is a reasonably thorough look at the project's inception and production, featuring set footage and interviews with producer Gary Foster, producer Russ Krasnoff, Steve Lopez, screenwriter Susannah Grant, Wright, Downey Jr, Jamie Foxx, cinematographer Seamus McGarvey, production designer Sarah Greenwood, LAMP (Los Angeles Men's Project) executive director Casey Horan, executive producer Patricia Whitcher, Midnight Mission director of recovery services Orlando Ward, Catherine Keener, Nathaniel Ayers, LA Philharmonic cellist/music technical consultant Ben Hong, artist Sean Daly, LA Philharmonic president and CEO Deborah Borda, and LA Philharmonic director of public relations Adam Crane. "Kindness, Courtesy and Respect: Mr. Ayers + Mr. Lopez" (4:48, HD) mostly consists of a sitdown between Ayers and Lopez; Jennifer Ayers also adds her comments. It's a shame this feature (styled to evoke the 60 Minutes profile strangely not included here--CBS is in the Paramount family, after all) isn't longer, but the disc's producers probably didn't want to dwell on the relatively low-key demeanors of Ayers and Lopez as compared to Foxx and Downey. "One Size Does Not Fit All: Addressing Homelessness in Los Angeles" (9:45, HD) helpfully delves into the state of the homeless situation in today's L.A. Interviewees include Wright, Ward, Horan, Krasnoff, Grant, Lopez, Jennifer Ayers, and Foster. "Julliard: The Education of Nathaniel Ayers" (4:08, HD) allows Foster to talk up the importance of the school to our nation's youth and artistic communities. Five "Deleted Scenes" (9:49, SD) turn out to be pretty entertaining trims well worth a look, and the film's "Theatrical Trailer" (2:33, HD) rounds out the disc. All site content © 2000-2019 Peter Canavese. Page generated at 04/20/2019 05:46:43AM.